Most of the time after downloading file from a site you might need to check the MD5 just to make sure the file downloaded is completed. If you have line problem, it's a must for you to check it. You downloaded new firmware and would like to flash it on your phone, my suggestion, check MD5 is a must! 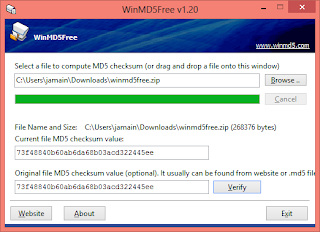 Run the application and check downloaded file MD5. If you don't have the MD5 characters, ask from the file owner for the MD5. Hope this will help you to avoid BOOTLOOP after installation. Go for sweetroom v10.5. Good performance and stable. Tw base hv full spen features.